Driving is great art. The more you drive; the better is your driving skill. However, there are some habits that we develop while driving. Some of these habits should not be developed as they can cause damage to your car and in return to your pocket! So here are 7 useful dos and don’ts about driving that you shall go through before your next trip! I have seen people who tend to drive single-handedly while their second-hand rests on the gear. 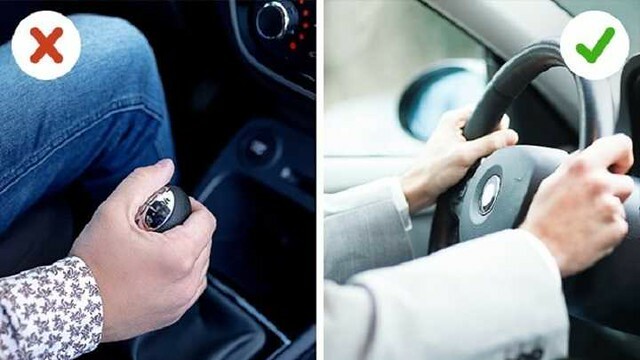 Such a habit does allow shifting gear swiftly, yet it is dangerous to rest your hand on the gearstick. Firstly, both of your hands should be on the steering so that you have full control over the car. Secondly, with constant hand pressure being applied to the gear, the synchronizers and gears get displaced. With such gear, you would find it difficult to shift the gear and would have to flow out money to get it fixed! Make sure that when you leave your car the fuel tank has enough fuel in it. When you opt for not using your car for days, some impurities get into the tank which takes the form of sediments. These sediments then get stuck into the filter and the fuel pump which cause damage to the car. Make sure you have at least half the tank full in winters as condensation forms in the tank and water in the fuel tank can lead to a problem like fuel tank deformation! Applying unnecessary brakes would lead you to replace brake pad and disc. When you get stuck in the traffic and have to apply regular brakes, you are risking your brakes life. Make sure you check your brake fluid regularly and change brake hoses timely! If your car is making a suspicious sound, do not ignore it, rather check why the car is making the sound and get the problem fixed right away or otherwise be prepared for a car breakdown in the middle of the road any time now! While parking the car, shift the car in “PARK” while holding the foot brake. Then pull the hand-brake and let go the brake slowly. Improper use of handbrake can cause gear troubles. Even though new cars don’t need a warm-up, yet if your temperature is operating don’t move above 2000 revs. In winters let your car engine run for 2 minutes before you take off. Recommended: Why the RPM goes up when we start the car engine? On a downhill, most people keep their foot on brakes. This causes the brake pads and disc to wear off. The right way to go down a hill or steep is to move towards lower gears and so that engine brakes can be initiated. Enjoy better driving with good habits!